Several weeks back I attended the 2015 Jersey Fest show here in New Jersey. As part of the three day weekend, I registered to take a miniature painting class, taught by Maya at Morland Studios. 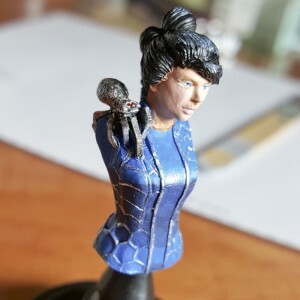 For the class fee of $65 you got two figures, one of which is the Sybil, Steampunk Lady Bust shown here, multiple bottles of paint, some high quality brushes, and, not least of all, hands-on training and critique by an extraordinary figure painter. I used to paint a lot of gaming miniatures. While in the Navy they were the only things portable enough for me to take with me to the bases and aboard ship. I was never very good at them, though, as soft modeling (organic shapes and surfaces) has never been my forte’, I’m better suited to the realms of hard modeling (mechanical items). I’ve always wanted to learn to paint realistic skin tones, though, and here was the perfect chance. Class attendance was 10 people, a nice small number to allow the instructor lots of one-on-one time with the group, and for individual critique. The only draw back was the generic fluorescent hotel conference room lighting, which did little for accurate color representation. I had my Optivisor with lights on-hand, though, and that helped a lot towards at least getting rid of the shadows. We worked exclusively in acrylics, and over the course of 5 hours, laid out the flesh tones with some shading, blocked out the blue and the blue shadow and highlights on the clothing, and blacked out the area of the hair. At that point it was nearly midnight and I couldn’t see straight anymore, so I called it a night. The following weekend I set Ms. Sybil up on my workbench and set to finish what I’d started. The results are pictured here. In person she looks fairly good, under the unwavering eye of the digital camera macro lens, she could be better. I had particular problems with the silver webbing, as the paint kept drying out on me after only a few strokes. Also, I’d like to have been more pronounced on the shadows on the face, they barely show at all. There’s also too much texture on the flesh for my liking, a result of over working the paint. Overall it was a great class, I learned a lot, and it was a lot of fun painting my first figure miniature in over 20 years. I plan on tackling a few more in the near future, and want to move up to larger scale figures at some point. Below are some in-progress shots. They’re not very clear due to that conference room lighting, but you’ll get a bit of an idea of the stages gone through.